I first heard Mahmoud al-Mabhouh’s name about 20 years ago, some time after the murder of IDF soldier Avi Sasportas. 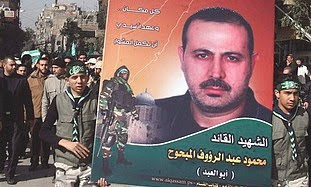 Ever since then, al-Mabhouh went off the radar screen, until he made his comeback two or three days ago as a lifeless body; a dead man. The cries and shouts that emerged from this man of terror’s funeral in Damascus over the weekend took me back at once to memories of one of the most noble people I have ever seen in my life; a woman who I never saw cry: Rachel Sasportas, Avi’s mother. If she did cry, and I have no doubt that her eyes were overwhelmed by tears, she must have done it behind closed doors. During daylight hours, she would walk to the officer of then-Defense Minister Yitzhak Rabin with her head held up high; she was quiet and restrained, almost whispering. Who decides in the Middle East? The Return of “Defensible Borders”? IDF violence against Arab women? Is Israel’s Safety No Longer a Western Interest?